“Look well to the spine for the cause of disease. 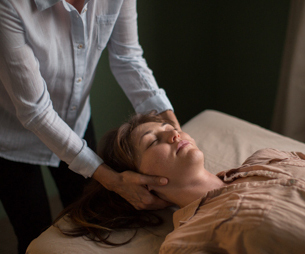 The method of chiropractic treatment Dr Stier practices is called Sacro Occipital Technique (SOT). “Sacro” means the sacrum, which is the foundation for the spine. “Occipital” relates to the occiput at the base of the skull. The gentle procedures employed in SOT normalize the relationship between the foundation of the spine and the top of the spine which is crucial in the normal functioning of the brain and spinal cord and, thus, regulation of all the body’s physiological systems. Structural, orthopedic, and neurological indicators identify which adjustments to perform. SOT adjustment methods work, to a great extent, by specifically positioning the body to use its own weight to correct imbalances. The procedures most often produce a feeling of relaxation.